The 2012 Olympic experience was an astonishing display of passion and discipline. 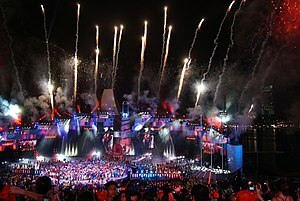 Danny Boyle and his team delivered a breathtaking 2012 London Olympics Closing Ceremony. What a way to capture the spirit of the Olympics! I wish that the games would have lasted just a little longer. Wondrous. Sensational. Dramatic. Astounding. These words come to mind summarizing the athletes, the games, and the opening and closing ceremonies. Before I share a list of songs that were included in a set called “A Symphony of British Music” (so aptly named! ), I wanted to highlight the Liverpool Philharmonic Youth Choir and the Liverpool Signing Choir who performed John Lennon’s “Imagine”. During this beautiful tribute, the world watched a surreal performance of the choirs singing with a video clip of Lennon singing the song. There were also young dancers who built a sculpture of the legendary singer/songwriter’s face. As I have mentioned in my opening ceremony post, I think Danny Boyle was brilliant for including so many adolescences in both ceremonies. What do these choirs represent? For me, they represent the beauty of many passionate young individuals coming together to build a strong community with a common love. They will grow, transform, and become stronger as they work together. They make this imperfect world a beautiful place.